As the holidays are approaching, one of the most language-rich and socially stimulating activities you can do is cook with your child! Things tend to get a little more hectic as we try to organize all our holiday events, so why not let your children help you with some of the holiday baking? Not only will they love it, but they will be engaging in a hands-on learning activity. We are all about making baked goods from scratch but let’s face it, it can take all day, be difficult and make a complete mess. Make it easier on yourself and your child by using some ready-made dough, batters and mixes. 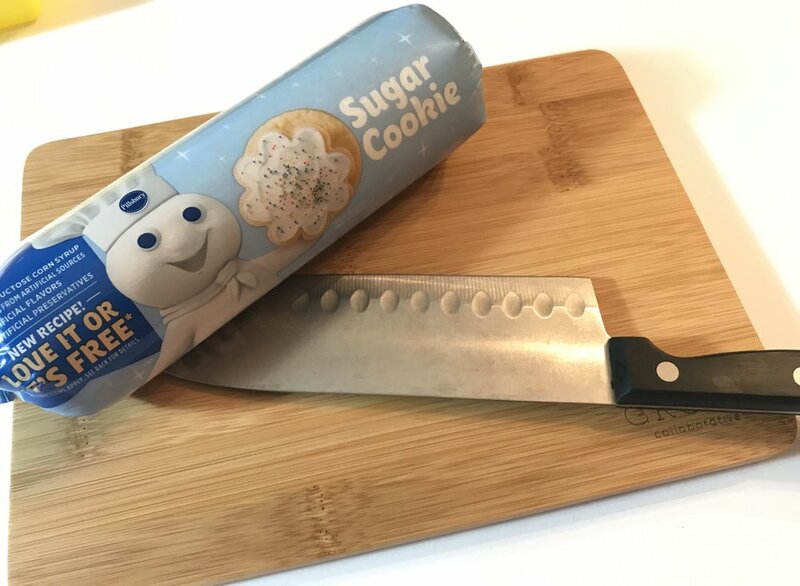 Slice and bake cookie dough is the best along with ready-made frosting as well as pancake mix, muffin mix, pie filling mix, brownie mix and more. They end result will be just as yummy as homemade and probably a lot less messy! Depending on your child’s level, you may need to help them through each step of the cooking process with hand-over-hand assistance, or you may let your child do the cooking independently while you supervise or occasionally coach them through it. 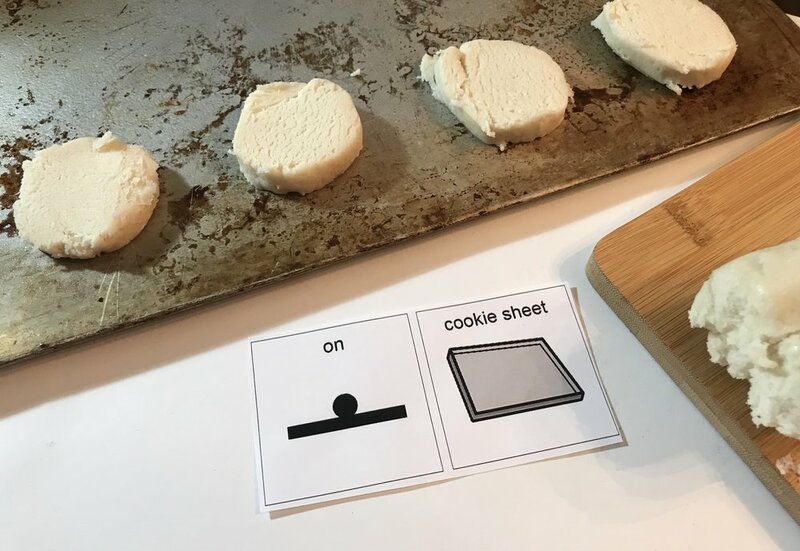 For all children, we want to use visual supports to help them understand, use the cooking language and to participate within the activity. We all use recipes, cookbooks, and refer to illustrations when we are baking and cooking. I typically won’t cook something new if I don’t have at least an illustration of what the final result should look like. Let’s provide your child with similar supports. Your child may need large picture symbols telling them each step of the cooking activity or your child may need a written out list of the steps for the cooking activity. The more visuals you provide for your child, the more successful they will be. Let’s set them up to succeed! Increasing Their Receptive and Expressive Language: Cooking is filled with language and your child will learn and use the language even faster since they will be watching you as well as engaging in a hands-on activity. Some great vocabulary you can address may be: dishes, utensils, bake ware (bowl, spoon, knife, scissors, spatula, measuring cup, measuring spoon, baking sheet, pan, oven, microwave, stove, oven mitt, etc. ); verbs (stir, pour, mix, spread, scoop, shake, cut, slice, cook, bake, open, close, etc. ); what you are making (pancake, cookie, pie, muffin, bread, frosting, sprinkles, etc. ); flavors (chocolate, vanilla, cinnamon, pumpkin, etc. ); descriptors/prepositions (hot, cold, warm, wet, dry, in, out, on, off, messy, sticky, yummy, yucky, like, don’t like, sweet, sour, crunchy, soft, etc.). Sequencing: Most cooking typically includes more than one step. Your child will be working on doing the correct steps in the correct order as well as understanding and using the sequencing language (i.e., first, second, third, last, then, next, etc.). 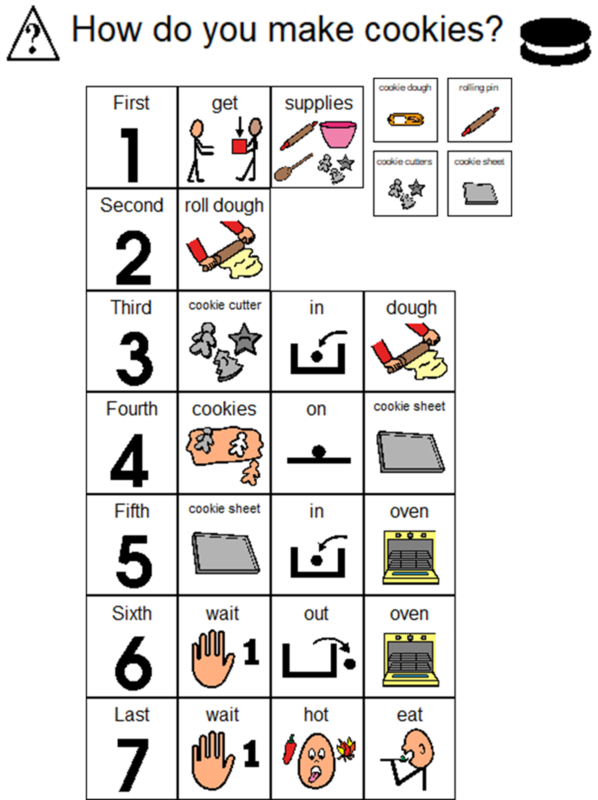 Again, a visual board representing the steps of the cooking activity would be very helpful for your child. Waiting: Waiting can be very, very difficult for our children….especially when we are making cookies and don’t understand why they are taking so long to bake! Have a “wait” picture card out and ready. Sing the “Waiting Song” (“waiting for cookies, waiting for cookies…..”) and set a kitchen timer so your child can see how much time is left. Verbally explain to them “5 more minutes for cookies. Waiting for cookies!” while showing them the “wait” picture and kitchen timer. This is a great skill for your child to work on since they have to wait in a variety of different contexts throughout their daily lives. Safety: The kitchen can be dangerous and your child needs to learn how to stay safe when they are in the kitchen. Working on “hot,” “no touch” is a great start. Try making a “Kitchen Safety Rules” list (of course with visuals added) addressing what is “dangerous” and what not to do in the kitchen. Math: Cooking is filled with math (adding, subtracting, dividing, fractions and more). Take what your child is learning in math class at school and incorporate it within the cooking activities! Sharing: “Share muffins. One for Cindy. One for Mom. One for Grandma. Share. Explaining How: After you finish have your child talk about or draw out the steps of how they made their cookies, cake, pie, etc. Don’t forget to take photos and video! You can take photos or video of you doing the cooking in advance and make your child a how-to sheet, book or movie. Also, take photos of your child as they cook. 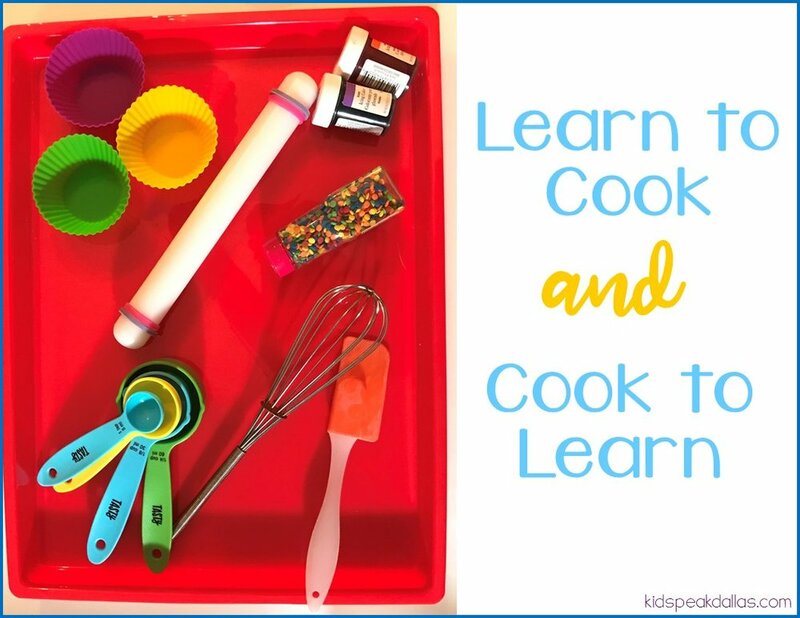 You can then make a “Cooking Book” or “Recipe Book” that your child can use to talk about the past or future as well as provide them with a visual supports to help them the next time they cook. You will also be working on increasing your child’s independence. What a great skill to teach….helping your child cook for themselves and others! So turn on some holiday music and get in the kitchen! Not only will cooking help your child learn wonderful language, social skills, kitchen safety and independence, but cooking will also help your child build their relationships with you, family and friends.